ATN Antennas, a company operated by Ray Naughton in the Victorian country town of Birchip designed and manufactured a large range of specialised amateur radio antennas and accessories. Included in this range were HF Monoband Yagis, HF Broadband Log Periodics covering 13 to 30 Mhz, VHF and UHF Yagis as well as Baluns, Power Dividers and Power Couplers. 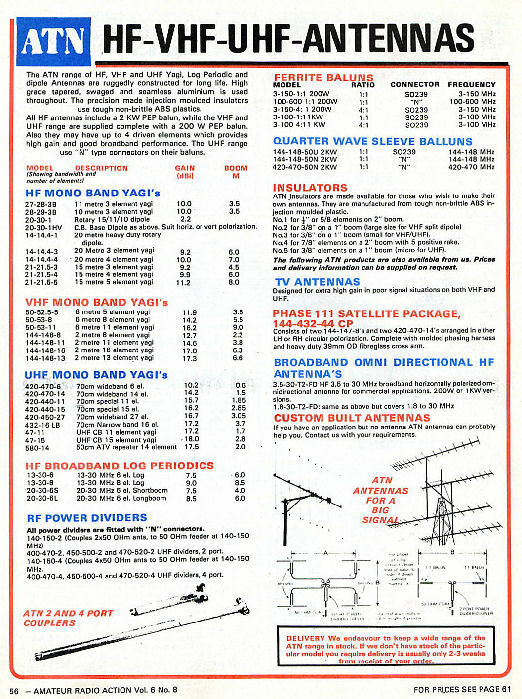 GFS Electronic Imports marketed the ATN Antenna range during the early to mid 1980's, as can be seen from the catalogue page above. ATN Antennas still operate in Birchip today. 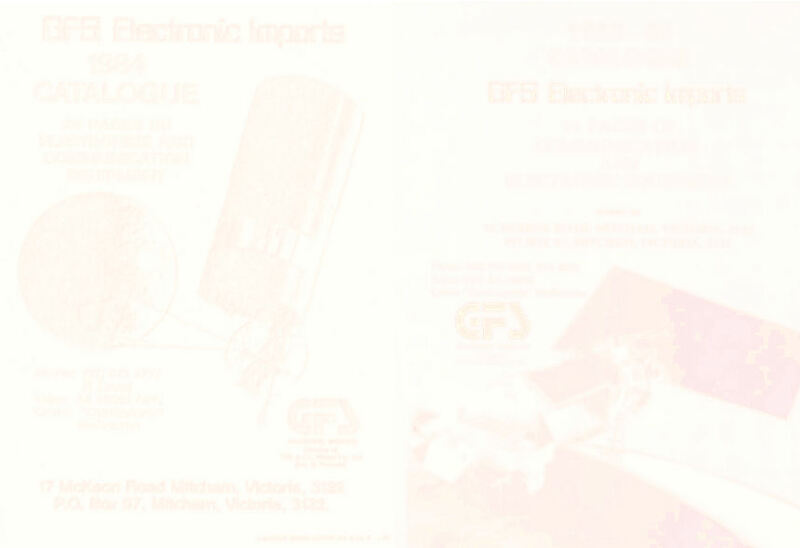 From their initial start in business in the late 1970's GFS Electronic Imports imported and sold the Japanese Emotator range of Antenna Rotators. 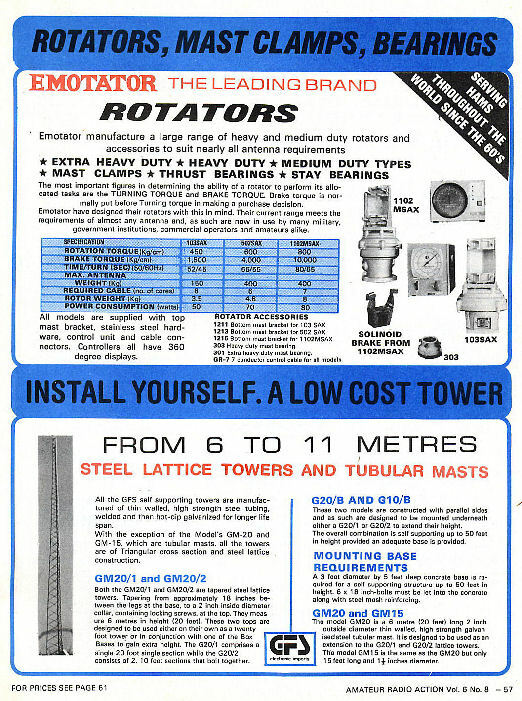 Emotator manufactured heavy, medium and light duty rotators designed to suit the rotation of such antennas as large as HF yagis through to small VHF and UHF beams. Steel lattice triangular cross section galvanised steel towers manufactured by a company in the Victorian country town of Warrnambool were a popular catalogue item for GFS Electronic Imports in the mid 1980's. These towers were easy to install and generally self supporting. Heights ranged from 6 to 11 metres, as can be seen above. Co-axial Cable and VSWR Meters - GFS Electronic Imports, by 1984, had for some time been Australian distributors of a range of low loss double shielded foam dielectric co-axial cable manufactured by Nippon Tsushin in Japan. The D-FB cable series featured lower insertion loss than traditional coax for the same cross sectional area. A number of different types of connectors were also available for D-FB co-axial cable. 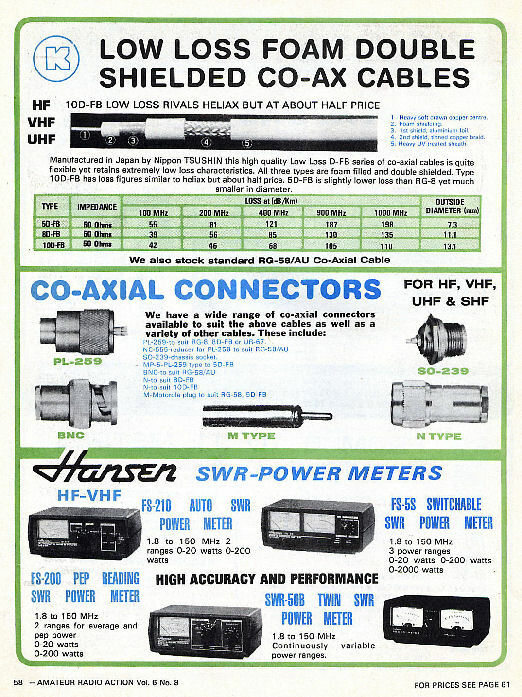 Hansen, a Japanese company who specialised in the design and manufacture of SWR and Power meters was represented in Australia by GFS Electronic Imports Their products ranged from a simple HF/VHF SWR Meter to PEP reading Power and SWR Meters, as can be seen from the 1984 catalogue page above. In the 1980's some amateur radio operators were experimenting with microwave operation. 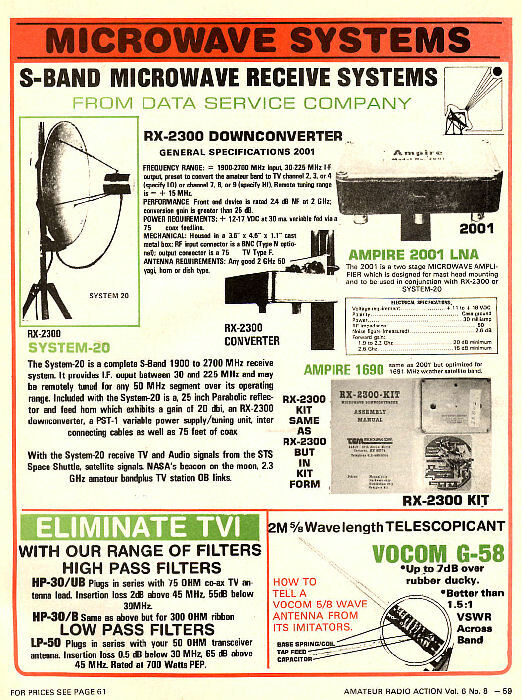 The catalogue page above shows Data Service Company's 2.3 Gigahertz low cost receiver and dish antenna products. A USA based microwave manufacturing business, Data Service Company was represented in Australia by GFS Electronic Imports through the mid 1980's. Locally manufactured High Pass and Low Pass Filters as well as a USA manufactured 5/8 wave 2 metre handie talkie antenna are also shown on the catalogue page above. 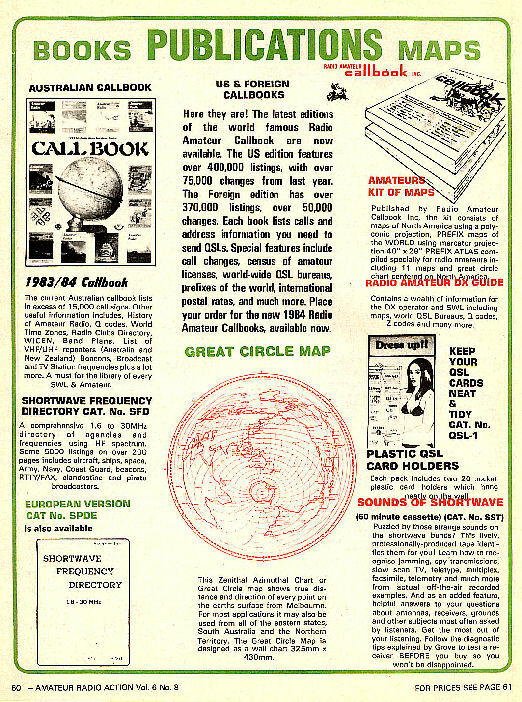 GFS Electronic Imports sold a number of publications, including the Australian Amateur Radio Callbook, US & World Amateur Radio Call Books, for short wave listener's a, Shortwave Frequency Directory and a Great Circle Map centred on Melbourne for obtaining worldwide beam antenna headings. 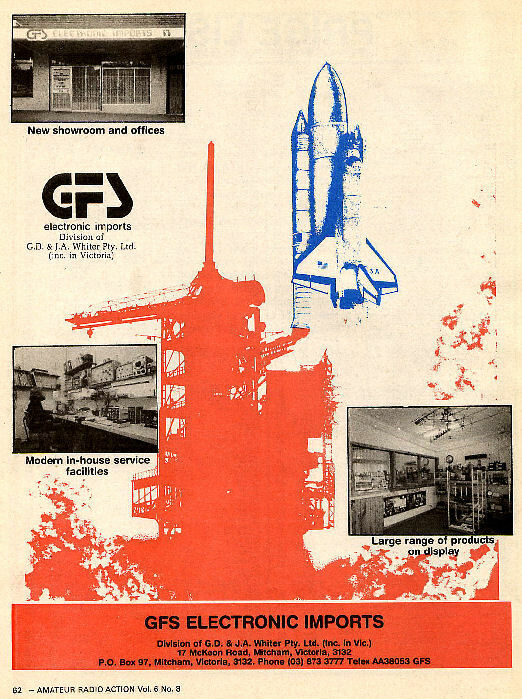 The outside back cover of the GFS Electronic Imports 1984 catalogue featured, as it's background, a line drawing of the launch of the first US Space Shuttle, Columbia. Other photos included am shot of the outside front of their 17 McKeon Road premises, a view of the service area including technician Jak Melia and a view of the front display area.